Hi friends! I want to share with you a super quick and easy way to make an outdoor pillow. 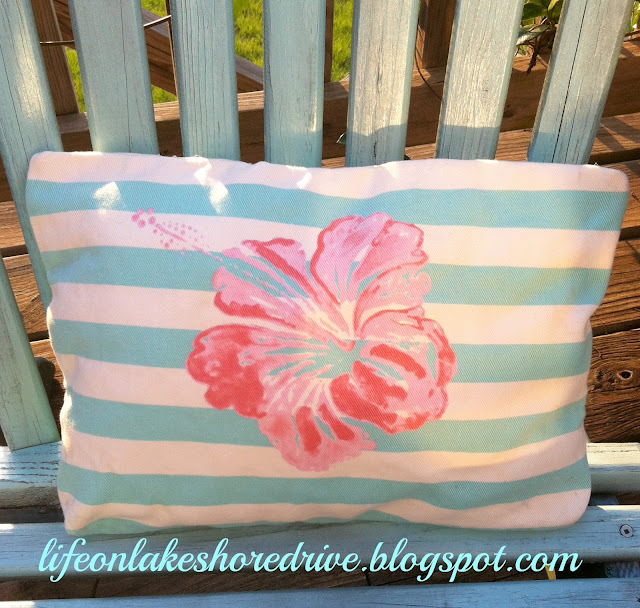 I must give Diane at in my own style credit for inspiring me with her fabulous way to use plastic grocery bags to stuff a pillow that is going to be used outside! Thanks Diane for the inspiration!!!!! 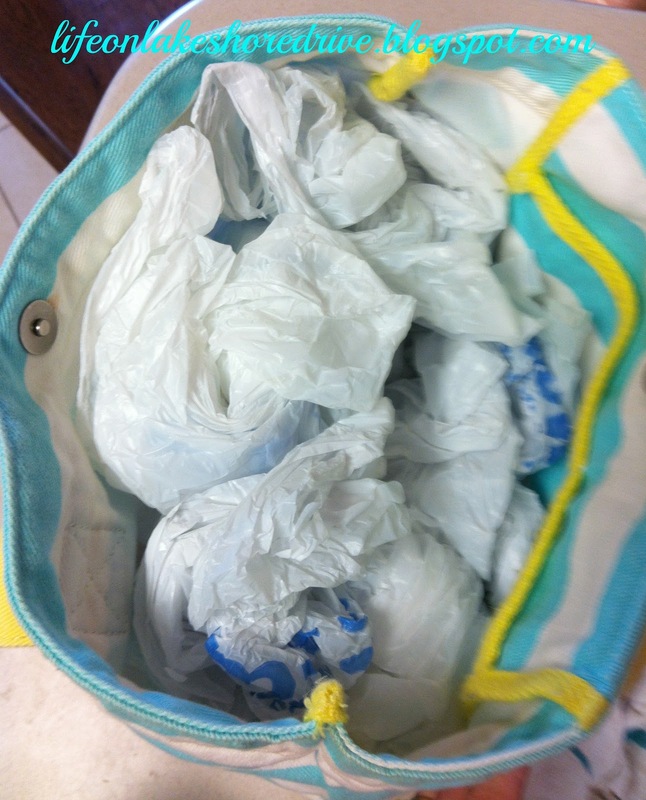 What an awesome way to recycle those mounds of plastic bags, and save money at the same time. If you missed Diane's tutorial on her pillows, you can check out her post here. The tutorial is great. So I'm going to give you the short version with a small twist on the pillow I made using Diane's idea. As my daughter was cleaning out her closet, this American Eagle bag caught my eye. First of all, it's one of the colors I am currently painting my Adirondack chairs, and the same color I used on my patio lantern in an earlier post. The bag is made of a very heavy canvas, and the perfect pillow size. That's when the light bulb came on. First, I cut the handles off, and then I stuffed it with the plastic grocery bags to a fullness I was happy with. For the next step, I folded the top down about an inch inside the bag. Using the hot glue gun, I glued the 2 sides together in small sections at time. VIOLA!!! The entire project seriously took only about 15 minutes to complete. I love it! I will definitely be on the hunt for more canvas bags. Here is a little sneak peek of my deck. It's still a work in progress, and I can't wait to share the finished project with you! 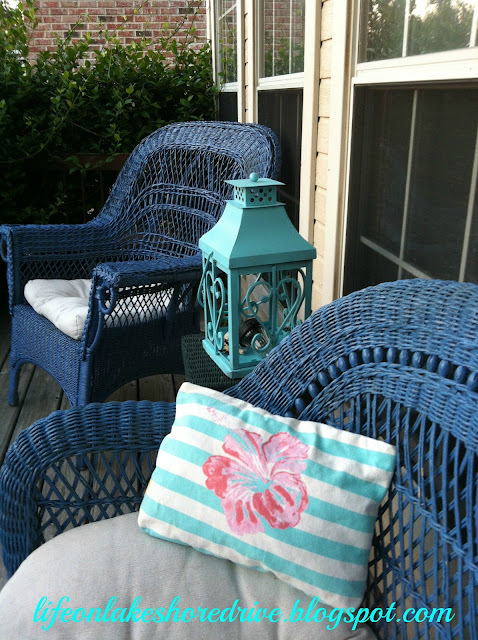 I just finished repainting the wicker chairs yesterday. I am mixing several shades of blue to brighten it up. I love how my new pillow looks with the lantern. One more glimpse of the layout of the back of my house. I took this picture the day we were moving in. 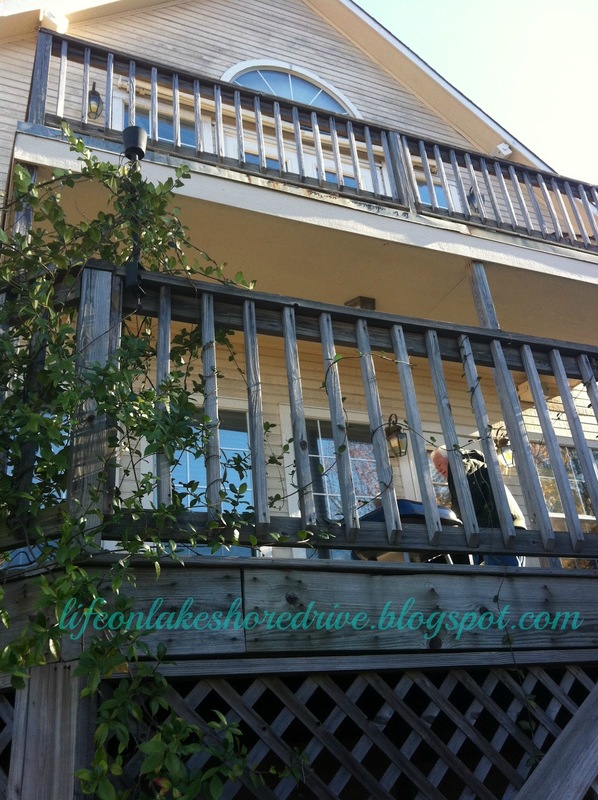 Yes, I actually have 2 decks needing a makeover!!! The houses in my neighborhood are designed to get the maximum view of the lake on both levels. I can't wait to show you more. house and find new life for something that was headed to Goodwill! What a great idea Kathy! 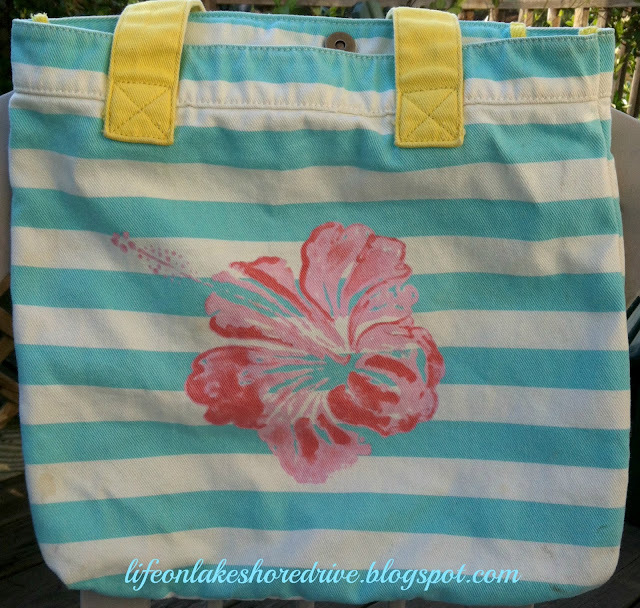 I have several summery bags that I don't use any more but just can't seem to part with. 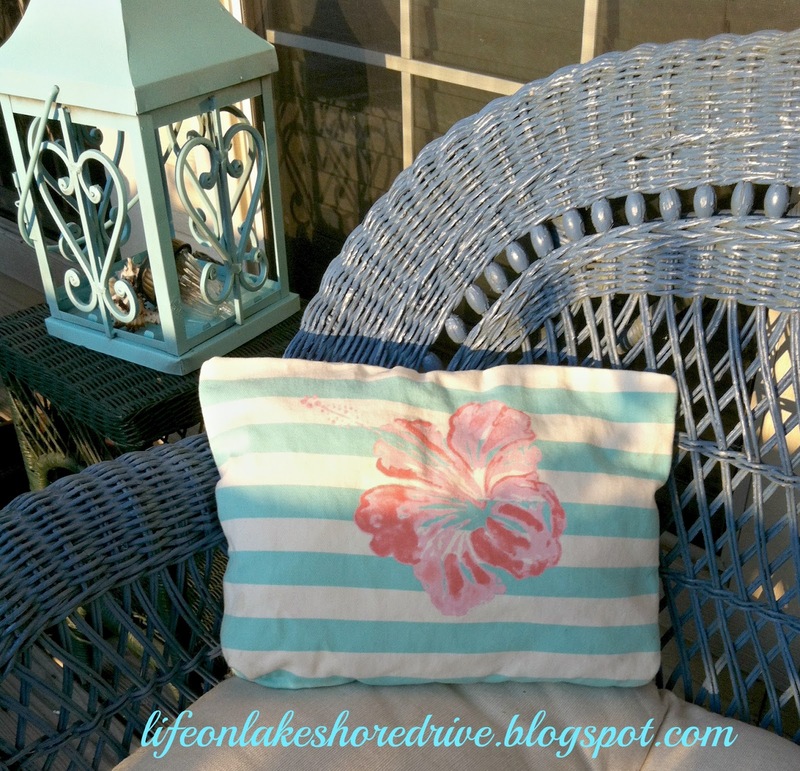 Thanks for linking up to the Summer Link Party!